In the United States, the average age of installed MR systems exceeds 11 years, according to a 2014 report from IMV Medical Information Division, up from slightly less than nine years in 2010. As equipment ages and technology advances, many imaging facilities may look to upgrade their equipment to differentiate themselves in the marketplace, improve their attractiveness to patients, and/or improve clinical capabilities. The result has been a rise in upgrades to 1.5T and 3T MR systems. Barry Southers, MEd, RT(R)(MR), a professor in the Advanced Medical Imaging Technology Program at the University of Cincinnati, has seen many in the industry move to higher field MR systems. Current trends, he notes, include upgrades to wide-bore, and higher field strength MR systems to accommodate an increasing national percentage of obesity. "There has definitely been a trend toward 3T over 1.5T MR systems. In my area alone, I know of at least eight or nine 3T MR systems installed over the past year or two," he says. "Higher field systems such as 3T provide exceptional detail, lower scan times, and increased signal, which leads to improved signal-to-noise [ratio], or SNR." Jonathan Furuyama, Toshiba's MR clinical sciences manager, says even outpatient centers and smaller hospitals are upgrading, and the company expects approximately $1 billion in business in 2016 when it comes to the MR segment. Still, 3T is more common in the higher-end sites or teaching universities, and 1.5T systems are more likely to be found at smaller hospitals or outpatient centers. "To many, 1.5 is the tried and true. It's very robust. But 3T has a lot of promise because the magnetic field strengths is two times as high, and, in theory, is supposed to have twice as much signal," Furuyama says. "There are some things that need to be overcome, and there is a lot of research being done on 3T to overcome some obstacles before they become as routine as 1.5." Kevin Abrams, MD, chief of radiology and section chief of neuroradiology and MRI at Baptist Hospital in Miami, utilizes both 1.5T and 3T MR in the facility. "We maintain that the higher magnetic fields strengths, which have better signal-to-noise ratio, is the way to go rather than the open MRI environment, which a lot of patients would ask for, without really realizing what that would entail," he says. "We were an early adapter of 3T and like anything else, there were certain bugs in it and things it was better for, and [other] things not so much better for. Fast forward to today, and the uniformity of the images has gotten better, there are no more problems with heating, and people over time have realized it's better to have the higher resolution." Heather Lewis, director of MR partnerships at Siemens Healthcare, says hospitals and facilities are looking more for efficiency and enterprise management, and have introduced MR systems that address these issues. "We've seen a need for expanding service lines, as many facilities are upgrading their MR, and we see a huge replacement wave coming in the next couple of years," she says. "Today's MR technology not only helps increase the diagnostic confidence with outstanding image quality but it can also help improve the patient experience." Lewis notes that more of today's patients are obese, and 70 cm has replaced 60 cm as the bore standard. Eric Jean, general manager for Philips MRI, notes that both hospitals and diagnostic imaging centers are looking for ways to get more value out of their radiology departments. 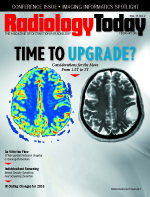 "With the shift to value-based payment models, radiology is reinventing itself to add more value," he says. "For example, we see a clear need for fast and robust MRI exams across the board. Based on market research, we can conclude that the main challenges in MRI are related to operator uncertainties, [image quality] artifacts, and unpredictable patient behavior. In 10% to 15% of the cases, this leads to rescans." With the current pressures on efficiency, this is the first thing facilities want to reduce, resulting in a focus on first-time-right imaging. "The other trend we see based on the shift to value-based payment models is that customers keep their equipment for a longer time. This leads to a need for staying up to date through upgrades, especially software upgrades with novel clinical applications or bigger conversions (eg, leave the magnet and replace the rest); these are popular with diagnostic imaging centers and small to midsized hospitals," Jean says. "New business models, to stay up to date (nonobsolescence), are likely to take flight, as capital investments are typically made once or twice during the system lifetime." Ioannis Panagiotelis, GE Healthcare's chief marketing officer for MR, notes that when it comes to MR, the company is noticing trends toward operational efficiency, clinical excellence, patient satisfaction, and strategic growth. "The increasing rate of replacement of 1.5T by 3T systems is attributed to the need to differentiate, attract more referrals, and increase efficiency," he says. "The recent introduction of 3T scanners by GE Healthcare has increased accessibility to 3T systems that can enable lower operating costs, improved workflow, and consistent performance for health systems." Abrams notes one trend in the systems has been the original equipment manufacturer making the bore diameter of the tunnel wider to produce less claustrophobia for patients and allowing larger patients to be scanned. "Not only are physicians demanding 1.5 and 3T, but there are [also] patients now who are more educated," he says. "They know the lingo and want to go where the best equipment is. Yes, they want to save money, but they want what's best for them." When comparing 1.5T with 3T, field strength is the biggest difference. A 1.5T MR system is approximately 30,000 times stronger than the Earth's magnetic field, whereas a 3T MR system is double that. Three tesla systems allow for higher SNR as well as increased image resolution capabilities, which is crucial for MR imaging. On the down side, gradient noise is generally louder at 3T compared with 1.5T, and specific absorption rate increases with higher field strengths. "3T systems have a much larger fringe field, so in order contain the magnetic field a lot of newer systems are utilizing both passive shielding as well as active shielding," Southers says. "If a facility is planning on replacing a 1.5T with a 3T in the same room, the room's shielding must be evaluated to ensure the fringe field is contained properly so it does not interfere with computer equipment, other imaging modalities in close proximity, or any area designated to the general public." Cost is an issue as well. Facilities' needs are different, but depending upon the configuration and system accessories, 3T systems can be considerably more expensive than 1.5T. "Most hospitals have 1.5T and are going to 3T because of its speed and better being prepared for the future," Lewis says. "For example, for prostate imaging, it will increase the signal and potential for better image clarity or better speed, or a hybrid of the two. It all goes back to the efficiency." Facilities may make the move to 3T because of the intrinsic higher resolution that can be achieved, expanding the system's value in some imaging scenarios, but the decision may also be driven by marketing needs in competitive environments. "The decision of when to purchase or upgrade an MR system is very dynamic," says Panagiotelis. "Health systems today must evaluate their patient population and demographics to determine what type of MR system can help best serve their patients' care. We call the SIGNA Continuum an upgrade path that allows all of our new MR platforms, such as the SIGNA Pioneer 3.0T, to stay at the cutting edge of clinical capabilities." The initial drive to upgrade to 1.5T or 3T equipment has been the increase in image quality as well as more efficient scanning. Higher field strengths provide higher resolution images, as well as the possibility to accelerate with higher factors. "For the clinical areas [neuroradiology] and musculoskeletal, 3T gives a higher resolution and more possibilities to do advanced work like looking at degenerative diseases, brain connectivity, or sports medicine," Jean says. "The initial challenges of 3T for other areas of the body have been overcome with technologies such as MultiTransmit, which make 3T also suitable for robust body and cardiac exams." Furuyama says people may be worrying about making a change now and seeing better things come along, but Toshiba (and other manufacturers) build upgrade paths into its systems; so, even if something new comes along soon, customers are not locked into older technology. Although traditionally 3T MR systems are more expensive but offer more advanced clinical capabilities, Panagiotelis says that with GE's SIGNA Pioneer 3.0T, which became commercially available in 2015, GE is offering the image quality and clinical performance capabilities of a 3T for more traditional settings, enabling greater value and outcomes for more health systems. "Our latest pioneering technology creates sharper scans, for more patients per day, assuring more comfort and less anxiety for your patients," Panagiotelis says. At Philips, Jean says an important consideration is to make sure that customers can upgrade in the future. "With dStream, our unique digital architecture introduced in 2010, we made a big step in creating channel-independent platforms. This allows our customers to easily upgrade to new technologies such as coils or new applications without the need for expensive hardware upgrades in the back end of the MRI," he says. "Our first-time-right imaging solutions launched [last] year at RSNA are both unique and address the key challenges for operators, patients, and radiologists." Those include ScanWise Implant, which addresses the challenge of operator uncertainty when scanning patients with MR Conditional Implants; mDIXON XD, which redefines fat-free imaging for all anatomies; and the MR in-bore solution, which addresses patients with anxiety by distracting them visually. "Using a mirror and a screen in the back of the magnet, we create an immersive experience for the patient," Jean says. "This, combined with ComforTone noise reduction and AutoVoice patient guidance, turns the exam into an event. Initial studies show a reduction in interrupted scans by using this technology." Toshiba has released several automated features for its 3T, allowing quicker exams for the brain and heart. "We just had a major upgrade on our 3T system; we're on Windows 7 now and have the authority to operate by the US Air Force, with all the cyber security," Furuyama says. "Some of the things we have worked on include workflow enhancements and patient comfort features." Many factors may play a role in deciding whether to purchase a MR scanner now or to wait, most notably financial reasons. Often, facilities have older systems that are not functioning properly and are in need of replacing. In other cases, a facility may have a financial surplus and purchasing a system now makes better financial sense as opposed to waiting. "MR imaging is big business, so facilities may feel the pressure to purchase a 3T system due to its increased scanning capabilities in order to market and attract more business from physicians, researchers, and patients," says Southers. "While GPO [group purchasing organization] pricing varies, typical list price for a 1.5T system is between $1 million and $1.5 million, while list price for a 3T system is between $2 million and $3 million, depending on software and hardware options included." Additional considerations may also include renovation of existing facilities to account for shielding, fringe field, vibration, and five gauss limits. Total upgrade costs must be coupled with increased operational costs to determine the total cost of an upgrade. "The direct financial ROI [return on investment] is easily calculated by adding total cost relative to the additional revenue opportunities provided by expanded service offerings," he says. "To determine the 'true' ROI, nonquantifiable benefits, such as consumer perception, reputation, and market presence, must also be considered."